When I pick up my CSA (Community Supported Agriculture) food share, I’m always excited to see what’s waiting for me. Vegetables of summer are bursting with flavor, cooling, and refreshing, and I love them. Just wash em’, chop em’ up, put em’ into a bowl, season with a yummy salad dressing, and drop in some feta cheese (optional, of course). 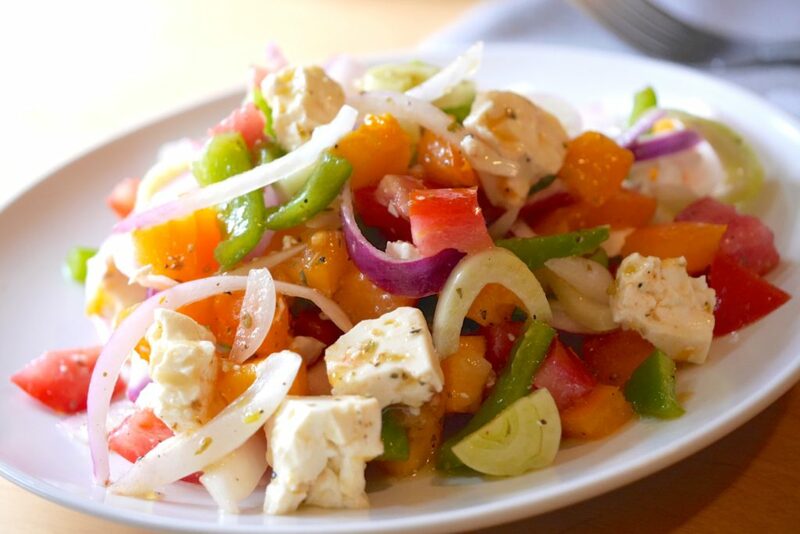 I like the feta in this salad because it adds some salty and savory flavors into this dish. Peel the onion and slice in half. Then slice into thin crescents and place into a large salad bowl. Dice the tomatoes and put into a colander with a pinch of salt, and let the excess liquid drain out for a few minutes, and then add the tomatoes into the salad bowl. Seed the green pepper and chop into 2-3 inch pieces. Add pepper into the salad bowl. Cut off the outer portion of the fennel bulb and discard. Dice remaining bulb into bite-sized pieces and add to the salad. Add feta cheese into the salad. In a small mixing bowl combine olive oil, lemon juice, white wine vinegar and oregano. Season with sea salt and black pepper. Pour dressing onto salad and toss lightly.